The government shutdown isn't like his other disaster relief efforts. The call to action for chef and activist Jose Andres' food relief organization to set up shop in the nation's capital is unlike the usual circumstances under which the group operates, dropping into towns ravaged by hurricanes or burnt to the ground by wildfires. In those cases, modern technology is often stripped away and volunteers with Andres' organization, World Central Kitchen, have to make their pop-up kitchens and food supply stations work for disaster victims in spite of spotty cell phone service or a lack of electricity. 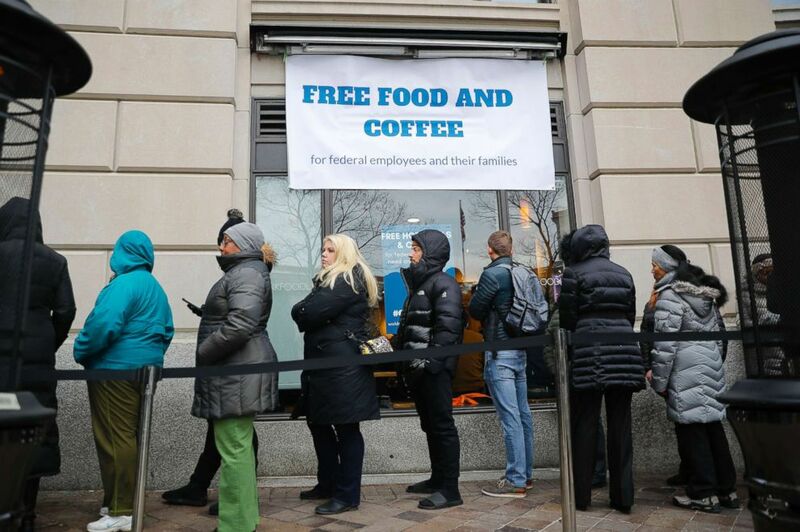 But in Washington, Tim Kilcoyne, a lead chef with the non-profit, set up a cafe and restaurant to feed federal workers that is fully furnished and already suited with a kitchen, not to mention surrounded by bustling businesses and busy streets. Here, the problem is not a fire or a flood -- they've arrived to help some of the 800,000 government employees who are still without a paycheck on day 26 of the longest-ever government shutdown. “Whether its activation for a natural disaster or a human disaster — we’re here to support, here to help,” Kilcoyne said. (Pablo Martinez Monsivais/AP) People wait in line at Chef Jose Andres' World Central Kitchen for free meals to workers effected by the government shutdown in Washington, Jan. 16, 2019. 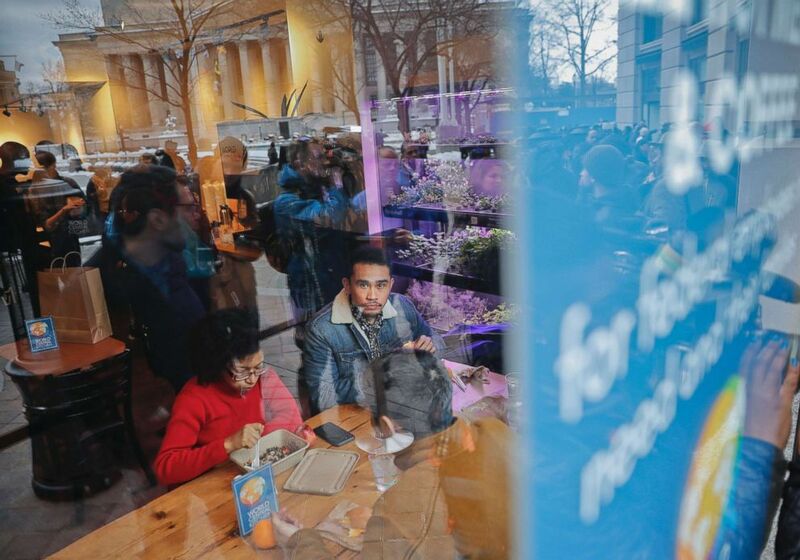 The pop-up, which opened on Wednesday, is called #ChefsForFeds and will be open from 11 a.m. to 6 p.m., seven days a week, to provide federal workers in the nation's capital with free meals at its location between Capitol Hill and the White House on Pennsylvania Avenue. Many of the volunteers working to cook for and serve the federal workers who come by are also federal workers themselves, some of whom are looking to fill the downtime they'd normally be spending at the office. "It seemed like a really good opportunity to give back and do something with my time in a way that's going to be meaningful, and hopefully help some people who are struggling," said Annie Shah, a furloughed federal employee who works for the Food and Drug Administration. Shah said the last 26 days have made her feel "stir crazy" sitting at home, unable to make travel plans because the government could open at any time. But she's also anxious and wants to keep up the work she was doing. "I love the work that I do and the people that I work with, and we have a really great mission at the FDA that I love to be a part of," she said. On opening day, #ChefsForFeds was ready to feed up to 2,000 federal employees and had already filled its volunteer needs, aided by the help of Shah and others. Tomato fennel bisque, a kale, brussel sprouts and quinoa power bowl and a fried egg sandwich with ham and cheese were on the menu. The pop-up is part of World Central Kitchen’s food-relief operation, which Andres started in 2010 after a devastating earthquake in Haiti. In the past year, WCK has served over 4.8 million meals to people in natural disasters zones around the world. Kilcoyne, who owns his own restaurant in Ventura County, California, got involved with the organization unexpectedly after his hometown was affected by wildfires. Since then, he’s been traveling nonstop. He estimates he’s been home for about 45 days in the last nine months. (Pablo Martinez Monsivais/AP) People seated begin to eat at Chef Jose Andres' World Central Kitchen as the organization begins to serve free meals to workers effected by the government shutdown in Washington, Jan. 16, 2019. “In the last year we’ve been in Guatemala for a volcano, California for wildfires, North Carolina and Florida for hurricanes. Those ones, we’re going into areas that are obviously completely affected by natural disasters that just happened,” Kilcoyne said. “This one is a lot different compared to anything we’re used to having to activate for,” he said, standing in front of shelves of olive oil and condiments in the back of ThinkFoodLab, a developmental kitchen space run by Andres that’s now being used for the pop-up. But at the end of the day, Kilcoyne said, the purpose of the organization is the same. “We’re chefs. We feed people,” he said. ABC News' Janet Weinstein and Rachel Scott contributed to this report.